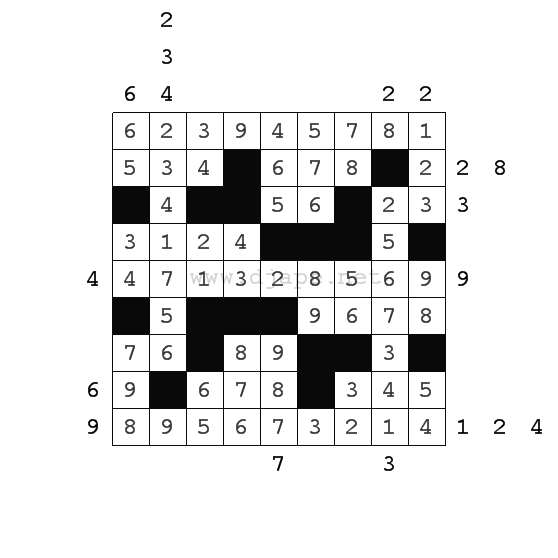 Here is a new variant of Outside Sudoku puzzles: Sudoku Straights. The rules of Outside Sudoku are explained here. The rules of Sudoku Straights are explained here. Now, all you need to do is combine them and apply them both. It’s a rather difficult puzzle (or so I think). What do you think? Outside Sudoku Straights for Friday, March 12, 2010 – Difficulty: IQ. This entry was posted in Free sample puzzles, Sudoku Variants and tagged IQ, Outside Sudoku, rules, straights, Sudoku Straights, variant. Bookmark the permalink. Post a comment or leave a trackback: Trackback URL. Thanks for a nice puzzle. Not an IQ. Very enjoyable.